Save big on the 2017 Official Track Edition! 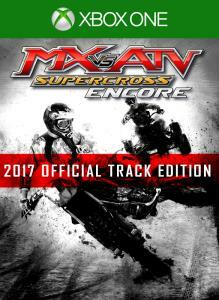 Includes: - Full game MX vs. ATV Supercross Encore with over 35 tracks - Plus 16 official tracks from the Supercross Championship season 2017 Rip, jump and scrub your way to victory in this vastly extended version! Only the Encore edition features the brand new Rhythm Racing mode, extra outdoor Nationals tracks, and exclusive Waypoint races in open world maps. 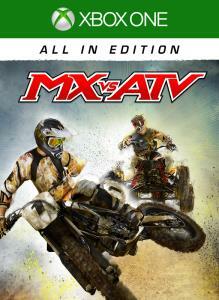 In celebration of the announcement of MX vs ATV All Out, we invite you to go "All In" before you go "All Out"! 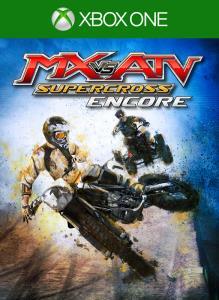 The MX vs ATV All In Edition contains the full game Supercross Encore plus all* available DLC! Get the original bikes, official 2017 Supercross tracks and much more than you can handle in one package at one great value.